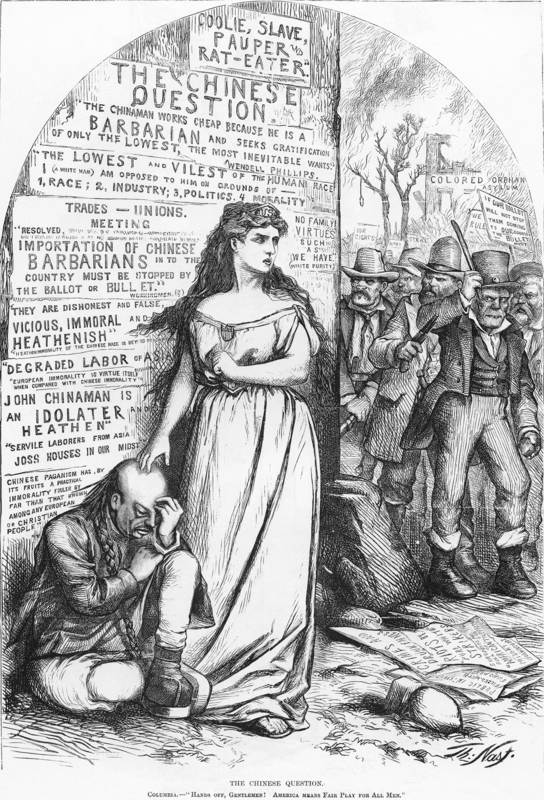 In this political cartoon from Harper's Weekly magazine, illustrator Thomas Nast portrays the figure of Columbia, a symbol of American democracy, comforting and protecting a Chinese man from a working-class immigrant mob. Nast likely created the text pasted on the wall behind them by combining actual and invented debate from the time. The caption supplies Columbia's words as "Hands off, Gentlemen! America means fair play for all men." The cartoon responded to a bill pending in the New York state legislature (introduced by state senator William Tweed, also "boss" of the notorious Tammany Hall and a frequent Nast target) which would prevent the state from hiring Chinese laborers. In 1882, the U.S. Congress passed the Chinese Exclusion Act, putting an end to Chinese immigration until well into the twentieth century. The Chinese Question. Columbia--"Hands off, gentlemen! America means fair play for all men." Source | Thomas Nast, "The Chinese Question," wood engraving, Harper's Weekly, 18 February 1871, from HarpWeek Cartoons, http://www.harpweek.com/09Cartoon/BrowseByDateCartoon.asp?Month=FebruaryandDate=18. Cite This document | Thomas Nast, “A Figure of Justice Protects the Chinese Immigrant,” HERB: Resources for Teachers, accessed April 22, 2019, https://herb.ashp.cuny.edu/items/show/637.